The Hautes-Pyrénées department of France has nine Tour de France mountains, including Col du Tourmalet and Col d'Aubisque. Matthew Collins, who runs at bike hire shop at the foot of the Tourmalet, shares his local knowledge. The Hautes-Pyrénées department is in the south-west of France, adjacent to the Spanish border. It is in the Midi-Pyrénées region of France. As the name suggests, the Hautes-Pyrénées encompasses the high mountains of the Pyrénées – the cycling here is all about either climbing or descending. Whether you're on a road bike grinding your way up France's legendary Col du Tourmalet, or on a mountain bike screaming your way down one of the trails at Cauterets Bike Park, you'll just love it here. In the Hautes-Pyrénées there are no fewer than nine cols made famous by the Tour de France, plus many other high mountain routes and passes near by. The Col du Tourmalet, Col d’Aubisque, Col du Soulor, Hautacam and Luz Ardiden – all these world class rides of the Pyrénées are all easily accessible, plus many other fantastic day trips, such as the one-way climbs to Pont d’Espagne or Gavarnie. 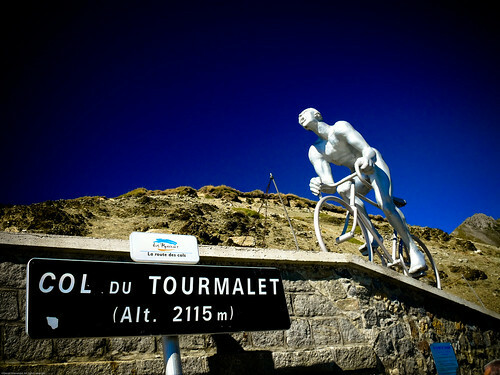 The Col du Tourmalet is the highest road in the central Pyrénées and has been included in the Tour de France more than any other pass – 77 times so far in Tour de France history. If it's your first time in the high mountains, you won't believe a climb can go on for so long. The Col d'Aubisque first appeared in the Tour de France in 1910 and since 1947 there have been 45 Tours over the summit, making it the second most visited mountain in Tour de France history. The climb from Luz St Sauveur to Luz Ardiden Ski Station last featured in the 2011 Tour de France, while Hautacam has featured in the Tour de France four times since 1994. Take into account the lesser known, but equally dramatic cols – such as the Col de Spandelles, Col de Tentes and the Col de Croix Blanche – and you have enough climbing to exhaust even the fittest cyclist. Most road cyclists come here for the cols, but if you're not so keen on climbing (or if you need a day off), there are easier rides around Argeles Gazost and Lourdes. Around Luz St Saveur and Argeles-Gazost there are 73 marked mountain bike (VTT) routes covering over 1,150km of trails. The trails are classified green, blue, red or black and vary in difficulty from flat trails, running alongside the Gave de Pau, to technical high mountain trails 50 km long with up to 1900m of climbing. Most of the easier trails are to be found in the Argeles Gazost Valley and around Arrens Marsous in the Val d'Azun. The more challenging trails with most elevation gains start at Luz St Saveur, Bareges, Cauterets and from the tops of the Col de Corraduque and the Col du Soulor. Longer cross country rides with not quite so much climbing can be found in the Pay de Lourdes. For downhill mountain biking, there's a ski lift at Tournaboup, a few kilometres past Bareges on the road to the Tourmalet, with green and blue beginner down hill VTT trails, and open during July and August. For the more experienced mountain biker, there are downhill trails serviced by a ski lift at Cauterets; for experts only, a funiculaire railway at the Pic du Jer near Lourdes provides access to red and black trails. For those wanting to ride the cols of the Hautes-Pyrénées, the season starts around the end of April, after the ski stations have shut and the cols are open again. Weather permitting, it's possible to ride through to the end of October. Like everywhere else in France, the roads can get very busy during July and the first couple of weeks of August, but even then it's possible to escape the crowds by riding one-way routes, such as the climb to Luz Ardiden Ski Station or Hautacam. For bike rental in the Hautes-Pyrénées, see Freewheeling France's bike hire listings, or get in touch with me at Ardiden Velos in Luz St Sauveur, where we have hire quality, lightweight carbon road bikes and mountain bikes for hire. There are many guided and self-guided cycling holiday options available for the Pyrenees. Most offer luggage transfer services across the cols, accommodation and detailed maps and route notes. Bike hire can usually also be arranged locally for you. Tours run throughout the warmer months, with many timed to tie in with the Tour de France. You can search our organised tours section here. There are a number of hotels, gites, pensions and lodges in the Hautes-Pyrénées that are cycling friendly. Most are in and around Argeles Gazost, Luz St Sauveur, Bareges or Bagnères-de-Bigorre. Bagnères-de-Bigorre is great for the Tourmalet, Aspin and Hourquette d'Ancizan and cycling through the Baronnies, a region with very rolling hills which is stunning. Only slightly further, past Aspin are the Cols of Azet and Pla d'Adet (finish point for stage 17 of 2014 Tour) and Peyresaude (Pyrenees Cycling Holidays B&B and Gite is a good option). In Bagnères-de-Bigorre, consider Les Dix Arches, a small hotel/B&B with everything a cyclist might need. At the base of the Tourmalet is Gite Belle Vie in Sainte Marie de Campan. It's run by cyclists for cyclists, and is handy for all the big cols, including Tourmalet and Aspin. See also the excellent Gite du Midi-Pyrénées, Chalet Tourmalet, and Le Sapin Fleuri. In Bareges, there's Chalet les Cailloux, a cyclst-run B&B 8km from the Tourmalet summit. Luz St Sauveur is also good base for easy access to the Col du Tourmalet and the climb to Luz Ardiden ski station. The official start of the climb of the Tourmalet is directly opposite the Office d'Tourisme in the heart of Luz St Sauveur. Hotel Les Templiers is in the centre of Luz St Sauveur and has 9 rooms and a restaurant. It has Wifi and secure bike parking. The spa town of Argeles Gazost gives easy access to the Col d'Aubisque, Col du Soulor and Hautacam, plus Cauterets and the Pont d'Espagne. There are also mountain bike routes covering more than 1000km, as well as family cycling routes from the voie vert that follows the Gave de Pau. For Col d'Aubisque, Lae de Haut is an excellent accommodation option for camping and B&B/self-catering. For Plateau de Beille and the Ariege Pyrenees, check out Bed Breakfast Bike Pyrenees. L'Arrieulat, Auberge des Pyrenees in Argeles Gazost has 18 rooms, a great restaurant (booking recommended) and a garden spa for at the end of a long bike ride. It also has secure bike parking. There are also a lot of good campsites – see the official camping in the Midi-Pyrénées website. Check here for links to other accommodation all over France, including hotels gîte, gîtes d’étape, B&B and self-catered options. For road biking, there is a booklet called Topoguide – Velo de route, in which there are 20 individual sheets, one for each road bike route, that show the routes in detail and the topography of the ride. For mountain biking, the FFC (Federation Francaise de Cyclisme) publishes a number of guidebooks that cover the 73 marked VTT routes in the Vallees des Gaves. There are individual sheets, one for each trail, that show the routes and elevation gain. These booklets can be bought from the Offices de Tourisme within the department (see below for links). Michelin have a map of the Hautes-Pyrénées and Pyrénées-Atlantique, as well as a regional Midi-Pyrénées maps. IGN has a dedicated Hautes-Pyrénées map, as well as a regional Midi-Pyrénées map. Cycling write Grame Fife has published a guide to cycling in the Pyrénées, Massif: Guide to the Great Road Climbs of the Pyrenees. Tour Climbs: The Complete Guide to Every Tour de France Mountain by Chris Sidwells features the Tourmalet, Col d’Aubisque and other Tour de France mountains in the Hautes-Pyrénées; there's also Ride a Stage of the Tour De France: The Legendary Climbs and How to Ride Them by Kristian Bauer. Graham Watson's Tour de France Travel Guide: The Complete Insider's Guide to Following the World's Greatest Race has practical information and advice on visiting areas synonymous with the Tour de France. Matthew Collins is owner of Ardiden Velos Bike Rentals in Luz St. Sauveur – at the foot of Col du Tourmalet.